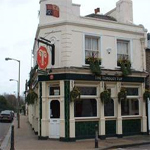 The Tonsley Tup nestles at the foot of 'The Tonsleys' in Wandsworth old Town. Small but perfectly formed. A feature of this Tup is our no food policy which means that you can order your own takeaway food from the pub or bring your supper or lunch and we will provide the wet bits! The manager, has a list of the best take-aways in the area and is happy to make his landlord's recommendations.